One of my goals this year was to complete 2 new case studies. One of those case studies is Vylo (a web based chat software project), and the other one is related to buying and selling sites. So, today I wanted to give an update on one of the sites that I purchased. I've written about the 2 sites I purchased previously; one I've called the “Pinterest site” and the other is an “Adsense site”. Today, I'll be covering the progress of the Adsense site. In a couple of days, I'll be covering the progress of the “Pinterest” site. I'm not going to be revealing the domain as you might suspect after what I had to deal with the last time I revealed my niche site. As with any project, the process is long term and sometimes the results are not immediate. However, despite not having any earth shattering news to report on the sites, I feel its important to share the tedious little tasks associated with these projects…and not just the rewards. One of the sites I bought at the beginning of this year, is a site that earns mostly from Google Adsense, but also has a little bit of Amazon Associates earnings. 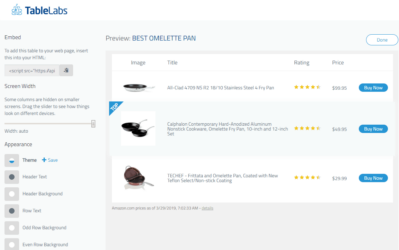 I don't want to give away too many details, but I'm comfortable saying that the site is in the electronics niche and focuses primarily on one product in that niche. When I purchased the site, it was getting about 200 visits a day and earning around $400 per month. So, these screenshots give you a good baseline of where the site was when I purchased it. Now lets dig into what I've been doing over the past couple of months. The plan for the site has been fairly simple, increase rankings by getting high quality links; and add more targeted content. So, I've done exactly that! In order to increase rankings for both the primary and secondary keywords, I've built about 5 Rank Hero links. I almost immediately started seeing an increase in traffic and rankings after doing this. I'll continue building more links using either my own private blog network or Rank Hero. 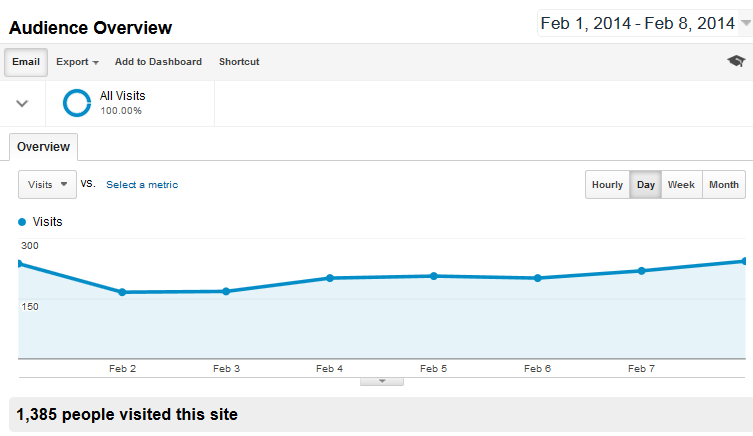 As a result, my traffic is now up to about an average of 244 visits per day – an INCREASE of over 20%! In addition to link building, I've also added some new content. Really only one major post at this point, but a few more are in the works targeting some low hanging fruit keywords in the niche (found using Long Tail Pro). I've also added a nice shopping comparison chart on the homepage of the site to try and increase the Amazon earnings. This was only implemented a couple of weeks ago, so I'm still monitoring results. Unfortunately, the increased traffic has not really increased my earnings too much. Or I should say, that I'm still not earning more than the site was originally. I'm not freaking out though, because I think a bit part of that was the fact that the site was originally a PHP site; but now I've moved it over to WordPress. The process of moving the site from html/PHP to WordPress was a pretty monumental task. But the previous owner had coded up a custom theme to keep the layout and look of the site pretty much exactly the same. I wanted to move it to WordPress to make it easier to manage in the future. The site still looks mostly the same, however, in the process the ad layout got changed a bit – and I think that has led to lower earnings. I just recently (perhaps a week or 2 ago?) went in and changed the ad layout for the site to hopefully convert better. I am already seeing some higher earning days, but there is still not enough data to make a determination. Maximize Earnings: I use a free ad tester called Ezoic which makes testing different ad placements very simple. Click here to try it out. I'm hoping this continues to trend up as the last few days have looked. Overall, earnings in March should get me close to the $300 mark; however, that's about $100 short of what it was earning before I bought it. So, I have a lot of work to do…BUT I do believe April will be a much better month because my traffic is increasing and I've now optimized the ads a bit better. Then I'm optimistic that the site will be more hands off from there. Its also possible that the earnings of December and January were seasonally higher than normal; meaning that $400 per month was higher than normal. However, I don't want to think about that being a possibility, as that would mean I bought the site based on inflated numbers. I really don't think that's the case, but I have to leave that open as a possibility…and if so, I need to learn from that! Either way, it doesn't matter, I just need to dig in and improve the site that I now own to the best of my abilities. Overall, I wanted to give you a quick update on what I've been working on over the past month or so for this Adsense site that I purchased. I'd love to hear your thoughts on this case study update. As always, feel free to ask any questions or give your input as you see fit. I'll be providing an update in the next couple of days on the “Pinterest” site that I purchased as well, so stay tuned for that. And of course, a big point of this case study is to get me some experience in the buying sites realm; then I can buy bigger sites later in the year hopefully. Thanks for the update! I find your case studies extremely educational. I’d love to read more about your process for improving ad layouts and conversions. I’ve experimented with different ad layouts on a few of my sites (and I’ve read a lot about ideal positions, color palettes, sizes), but conversion rates remain the same. I hope your layout tweaks are successful! Thanks Mandi…I’ll definitely provide some more details on the optimization of ads if it proves successful. I think that’s a lot of revenue for that much traffic, so I’d be very interested in seeing the design elements! I have a site right now that is getting about 700-800 uniques per day (1800-2400 pageviews), but isn’t even earning as much as yours, so I’m sitting here wondering what the heck I’m doing wrong. I’ll be following closely. Thanks for so much insight. A site’s earnings depend heavily on what niche its in. So you might be doing very well for the particular niche you are in; whereas I might not be doing very well for the niche I’m in. Its hard for me to know what changed on the earnings; because I don’t have access to the previous owners adsense account. So its tough to say if its less clicks or lower earnings per click. Hi Spencer, Would it be possible to share the ad layout that is still working well for you post panda. Similar to Sebastian I have a beauty and wellness blog that has 1,300 visits per day but pull in only $4/day as Adsense earnings. I have tried a few ad placement changes but the Ad CTR is still pretty low at 2%. Your advise would be much appreciated. 336×280 unit or 300×250 unit just below the post title either right or left justified is going to be the biggest earner most likely. 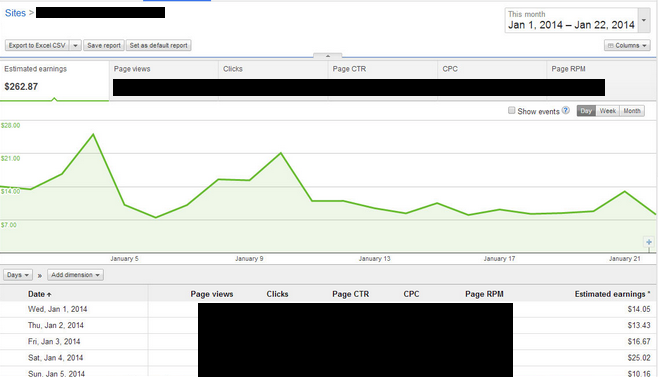 I have a similar ctr, also CPC is really low compared to other niches…i think thats basically the reason. I will stay away from health niches in the future. One thing I want to try is to sell an ebook…I think that could be a good way to monetize the health niche. Also try Amazon…I am selling some niche related ebooks and its making some money. @Spencer: i basically have the ad setup you described. a 300×250 unit at the top right and the 336×280 unit in the middle of the article. Also optimized color etc via google ad experiments. there is not much more I can think of honestly..
With the amount of traffic you guys are getting (40k – 70k visits a month) you should be looking to monetize in a different way from ads, as it seems the ads are not paying out too much for you. Have you tried advertising affiliate products? CPA offers? What about collecting email addresses? I would recommend collecting emails. I made the mistake before where I had a couple of sites pulling in about 40k visits each per month and was happy to pull in about $1200 / month between the two. When I finally added an opt-in form I seriously started to increase my income with just a handful of subscribers that were growing every day. Unfortunately the Google updates killed the traffic to those sites overnight. I was still able to extract some revenue from those emails that I’d collected but I’m still kicking myself for adding the optin form too late…imagine if I’d added it a year or two earlier. Darren, that sounds really interesting! 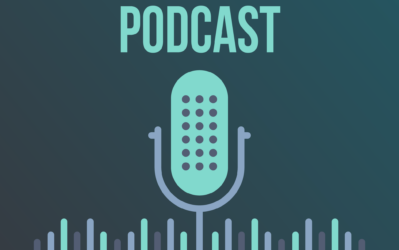 how did you monetize your email list? I have an opt-in form and i am also giving away a mini ebook for free. i have almost 1000 subscribers but havent done anything with that list. Then its probably time to start building an email list and selling your own products ideally. (Although you could probably do okay with affiliate products too). Thanks for sharing everything Spencer, I always learn a ton. Do you know why the previous owner would have put the site on PHP rather than WordPress to begin with? Was he just more knowledgeable and comfortable with PHP? He was comfortable with PHP. Thanks for the great update and transparency as always Spencer! Thanks for tip on where to place adsense ads – was wondering which size and type you generally use? Also, was curious as to why you chose not to use adsense for apennyshaved? I have a similar site and have lot’s of Amazon affiliate links much more then apennyshaved and I also have the typical adsense ads and have yet to be penalized. The only reason we are not using adsense on apennyshaved is to keep the adsense account private. Most people are just here to learn, but a small percentage of readers here would either clickbomb or seek out all our other sites if they had access to our adsense ads. However, I absolutely think people should be using Adsense and Amazon together on their sites. Would it be best practice to avoid having both Amazon and Adsense on the same page of a website ? Would you think it matters ? Having them combined is fine. Very cool update. Question about Rank Hero…does Rank Hero do anything to prevent competitors from just jumping onto MOZ or Majestic SEO and essentially seeing the sites where you’re likely getting your Rank Hero links from? How does that work, exactly? Another thing…you mentioned you might get additional backlinks either through Rank Hero again, or your own private blog network. Is there a risk in using Rank Hero for multiple sites on one host? 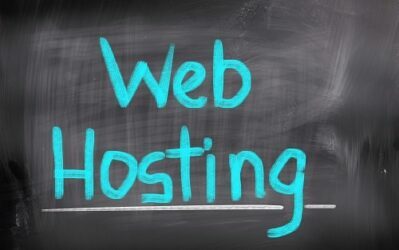 For example, if I have five sites on HostGator, and I use Rank Hero for three of those sites, does that put me at more risk than if I used Rank Hero for one site on HostGator, another site hosted on Bluehost, and another site hosted on GoDaddy? Does diversification there matter at all? There are different silos/networks within rank hero, so if any sites were in fact figured out, it would only be a very small number. I use Rank Hero for multiple sites on one host; there really isn’t much risk because every site on Rank Hero is on a different IP; and I use different sites withing rank hero (you can choose) to link to my sites; so the link profiles are completely different. I love reading over your reports and have actually built a few niche sites myself thanks to your great content. But a while back, my AdSense account was disabled for invald activity and i haven’t been able to get it back ever since. This happened because the marketing service i was using was sending fake bots and tons of spam traffic. I should have known better and admit it was a mistake. I was even being targeted by competitors sending fake traffic to my Adsense websites. As a result, all my income has dropped from these niche sites. I know you were in a similar situation before, so I’m wondering if i could get some tips on how to possibly get my AdSense account back? Or what to write in my account appeal forms because they have also been rejected? Any information would help me lots. Thanks Spencer! I consider you the adsense expert. I took my homepage to page 2 and every other page to page 1 or 2. 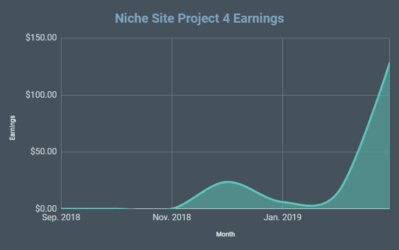 After seeing a fat paycheck of $0.38 in adsense and $1.80 in affiliate commissions, I’ve since stopped trying to rank the site and moved onto other projects, which is probably a mistake as I could get it to page 1 fairly easily. 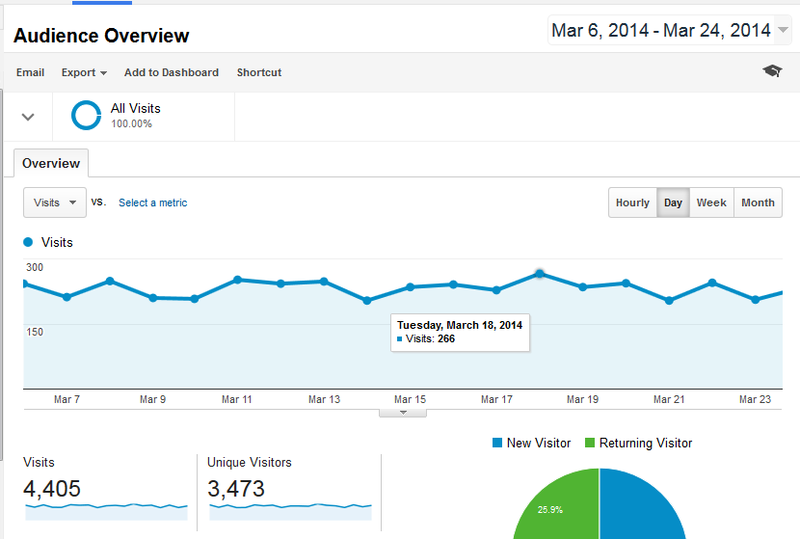 Im only getting about 1.1k visitors a month atm. Anyway you ever have sites like this that once they go from 2nd page to 1st and maybe some better ad placement, they shoot up from cents to dollars and start to actually make a decent chunk of change per month? I feel this niche is a poor choice for adsense as its very much like a hobby of a hobby, but it was a tester for me to learn SEO. Its all about the traffic and earnings per visitor. If you only had 10 or 20 visitors, then 0.38 is okay. But if you had thousands of visitors then 0.38 is terrible. Just curious – would you mind sharing what you paid to purchase a site making $300 a month? Interesting that you were able to take over a non-WP site without too much trouble, with the help of the original owner…..thanks for sharing the update. Wonderful update here, nice to see your earnings. Waiting to see that of the Pinterest website. Please what product is that exactly? Can’t wait to hear what you’ll do to improve this site, I’m thinking off adding adsense to my site as well. Would it be worth it if it’s getting around 200 visitors a day? Is there anything a beginner like me should know besides good ad placement and not cheating the system? My site above is getting about 200 visitors a day, so yes, you should try adsense. Just test and tweak over time to optimize. Thanks for the update. 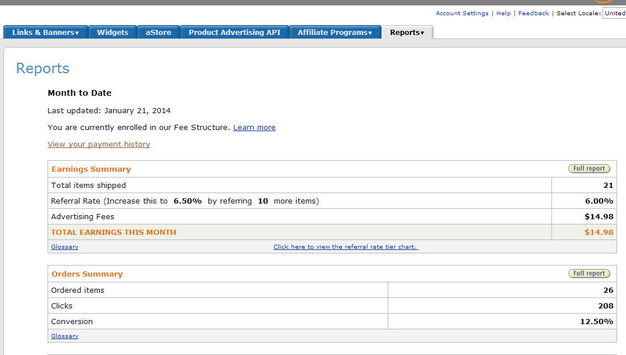 Interesting that you are getting so much adsense income but not much amazon income. How exactly is this site laid out? If its a review site, I would think the revenue would be opposite. I’m guessing you are targeting keywords that aren’t product related. I do the same thing but my amazon revenue is still 50% of my adsense revenue. You could definitely improve your earnings here. The product must be pretty lousy! The keywords are product related; but many are informational about the product. So people that already own the product are searching for these keywords. If your cpc has gone down and you have a ton of advertisers, maybe it might benefit you to block certain ads from showing. Good luck Spencer! Any thoughts on this Spencer? Thank for this case study. It is a living one indeed. I will love to keep track of your performance trail into the future. Thank you for the update! I actually find these really helpful—the nuts-and-bolts operations stuff. Thanks for the inspiration! 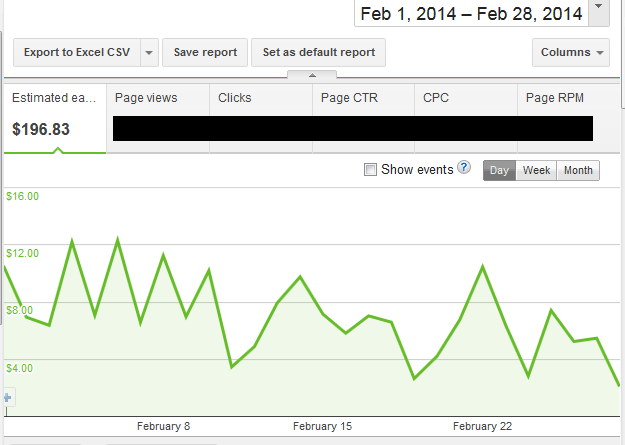 I am starting an “adsense rehab” case study myself. I have a site in the medical professions niche that has about 19 articles published over a few years but has never really done much. Using your excellent guidance, I have started to better target low hanging kw using lt kw pro. The key I guess the with the low hanging stuff is to have a decent cpc and advertiser comp. I usually target words that have a KC score under 30. Thanks for all the great ideas…..
My question may look a little funny , but I was in a quandary . Is adsense can be combined with amazon affiliate ? Yes, they can be combined. I think it still need time. Why? There are some changes of the site. Spencer, thanks for the update. How are you re-positioning the ads? Meaning are you changing locations, ad sizes, colors, etc? Would love to hear what changes you made to the layout too once you have more data to show whether it worked or didn’t. Correct. For example, there was a 720×90 ad blog above the posts previously, I changed to a 300×250 unit just below blog post title (left justified). Those kinds of changes…then of course I will test colors as well. Another great post here. You have me pumped up about Adsense again. I get 600 visitors per day and like Higgins above, 70% of my traffic is from mobile users. But, my monthly revenue has never exceeded $100 and my CTR seems low to me. My niche is software, so you would thing the ads are on the pricier side. I agree that the best performing ad is the one at the top like you said. Where do you place the other 2 ads on your pages? What sizes are they? And do you just use text ads? Usually I place another ad in middle of post or at end. Then one on the sidebar. I’ll also use a link unit on some sites near the top navigation bar. I go with text and image ads. I need advice on my AdSense site and have been waiting for the subject to come up. It’s an information site in the careers niche, ranks #3 for its primary keyword, and is on the first page for another 200 long tail keywords. 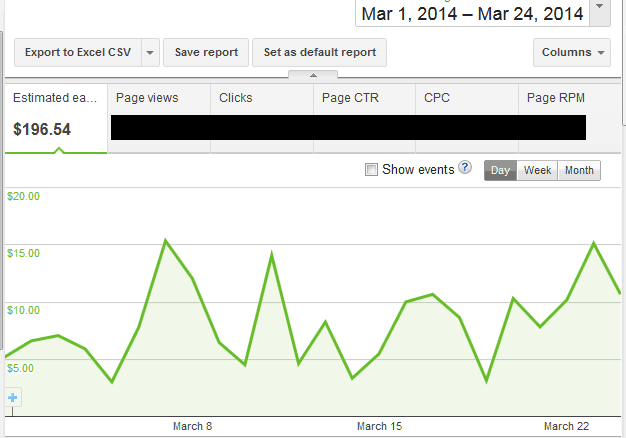 It’s getting about 100 visits per day, half of which are from the primary keyword with a 9% CTR on Google. That’s okay and there’s room for improvement if I can get it to #1. The thing that worries me is the AdSense click through rate. It’s like 0.1% and the site has only earned $6 in March. The CPC is healthy – if only I could get some clicks! I’m using the 336×280 ad just below the title with the text flowing around it like Spencer recommends. There’s also a 728×15 ad unit across the top that looks like a site menu. Unfortunately, it may be related to your keyword – for whatever reason people searching for your key term don’t appear to want to click any ads. You can try different colors or even more drastic would be a theme change; perhaps a new look will change how users interact with your site. Hey Rick, to get the highest CTR on my sites I’ve put a 728×90 at the top and bottom of a post, these then turn into 300×250 units on mobile. These are then blended into the site using the same colour scheme as the site. I’ve got rid of ad units altogether, if the visitor is going to click on an ad I want them to click on one that has higher CPC, which the bigger units tend to have. Hope this helps as there are tons of sites out there offering advice but this is something that I have actually tried and tested! It gets at 5% CTR on a good day on my site. Also try re-targeting some of the web pages for higher CPC keywords. Im following this update with interest.my site gets around 2oo visits a day and I only make a dollar a day althought the cpc is $0.60.Trying to shift the layout but no real difference.Do you make use of adsense adlinks on the site? Yes, I usually have an ad link unit near the top navigation bar – and sometimes at the end of articles. In regards to Adsense people who are searching for specific products are click happy. Several years ago everyone was buying EMD’s (with company names in it) and making a killing. After the updates everyone’s sites dropped like a brick. 30 miles down the road from you Spencer, a teacher friend of mine own’s a very popular education site and I told him he should add adsense to his site. Well he did that and now he is a millionaire. NO JOKE. He is now making more money from adsense than selling his own products. As you can imagine he retired and hired a web designer away from microsoft to work exclusively in his site. Now my question: I have a site that is 14 yrs old and did real well for some time. I have lost interest in IM the last few years and didn’t do anything with it. Is it worth my time to work on that site or just create a new site? Bob, that’s amazing! I would love to get in touch with the guy that lives 30 miles away from me. I agree, that Adsense is a pretty awesome way to earn money from sites…still my favorite affiliate/ad income source. If you are not interested in the site, maybe you could sell it? However, if you have any interest in reviving it, it could be worth your time – really depends on if its penalized, gets any traffic, etc. I really believe that Adsense, not Amazon is the way to go. The Amazon payouts are just too small to justify any SEO budget. I would rather prefer Clickbank or a cpa offer if I were to promote products. Of course, having your own products are the real preferred method of choice. How are you guys getting on with Vylo? Also with regards rank hero did you guys notice any activity early last week ? Vylo is coming along well – still under development. Hopefully we’ll have another update mid-April. Didn’t notice anything with Rank Hero. I just wanted you to know that long tail pro is awesome and has helped me grow my website traffic significantly on a few of my niche sites. I do have one question regarding your ad layout on your niche sites. You said you usually have one large ad justified to the right or left of your title and the rest lower on the page. How far down is your 1st ad? I have a competitor that has a large image above the fold and couple of ads directly under the image, but before the content. It seems Googles page layout didn’t penalize his/her site because it only saw the image above the fold, but mine was penalized by having a large rectangle and banner above the fold, even though my content was clearly visible above the fold as well. It occurred on the page layout refresh. I don’t want to push everything down the page with a large image just to avoid a penalty, but I wanted to get your advice and opinion on it. I’m curious if you outsourced the article writing as you add new content on this site. Since it’s in the electronics niche, how did you find quality writers that are knowledgeable in that area? I am also interested in this ? Hope fully it will help me earn more with adsense. I hired a good writer…Perrin! As you know, with research you can gain alot of knowledge about any subject. The ability to write and ability to explain complex things in a simple manner is perhaps more important that having first hand experience with a product. Hey Spencer, I know your methods have changed lately and now your onto bigger and better things. However, where is the opportunities at these days for the small frys like me interested in building niche sites? Amazon sites? Micro niche sites? MFA sites? CPA or PPL Affiliate sites? All the options you mentioned are basically the same thing :). What you’ve mentioned is simply how to monetize a site. The sites themselves are all essentially the same, it just whether you put adsense code or amazon code, or affliate links etc on your site. 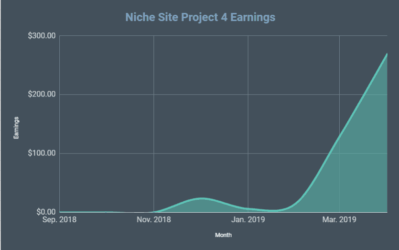 So, the answer is yes…build a high quality niche website that is targeting a keyword, just like I’ve shown here: https://www.nichepursuits.com/niche-site-project-2-overview/ . Then monetize it however you want (ie – option that makes the most money). Thank you for sharing your case study Spencer. Thanks for the post Spencer. May I ask where did you buy the site from? Any recommended sites to buy and sell websites? Thqnk for update spencer.. i have website with 1000 visitor a day..but only 3-5 click a day.. how many ads i can used? Bcause,i hear only 3 ads that adsense allow..but some site have more than 3..it is okey? One more.. where do you buy that website.. flippa? You can have 3 ad units and 2 link units per site. Read google adsense guidelines. I bought the adsense site privately from a reader of nichepursuits. I will making your case study as my basis in increasing my site’s traffic with Adsense. I will sure wait for your other on-line experiments!